Richmond, Virginia’s punk metal crossover party legends Municipal Waste rose from the salty remains of a New Years Eve Keg Party in 2000/2001, in which they were later blamed for inciting a minor riot. What did you honestly expect at a New Years Eve party, seriously? From the outset Municipal Waste have been an unstoppable force, with their endless touring schedule and consistent recorded out put, they’ve earned the title prize of being one of the hardest working, and well respected, bands with in their scene, that being thrash metal, which is a genre that over the past 10 years has had a massive cult like resurgence. 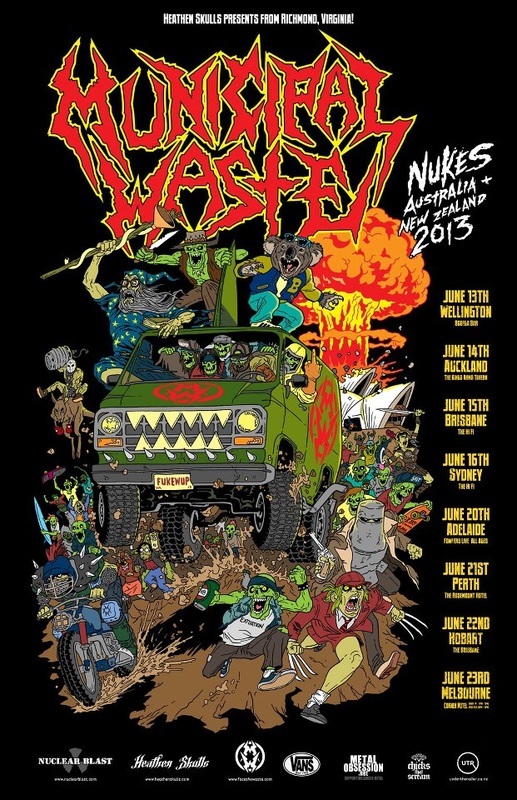 Riding high on the release of their new album, their first for Nuclear Blast records, the Fatal Feast, Municipal Waste are finally returning to Australia, after a massively long 7-year hiatus. See them this June thrash across New Zealand and Australia!